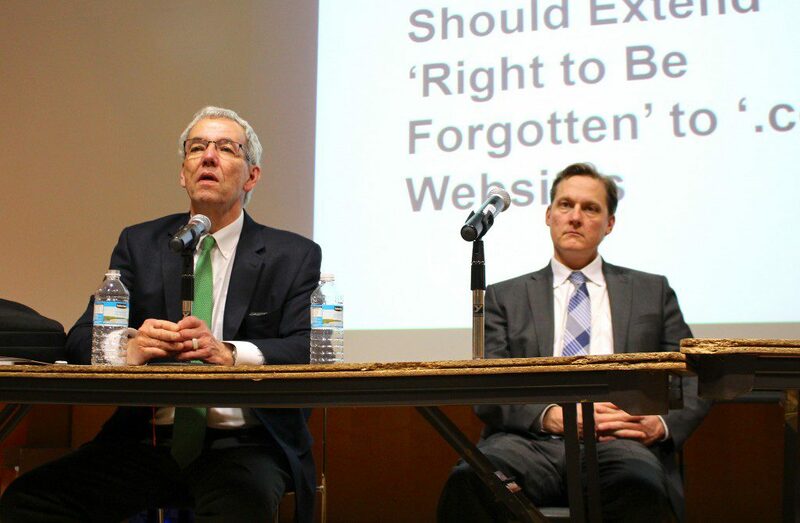 Efforts by individuals to have unflattering stories or reviews about them erased from the Internet are attempts to rewrite history that news organizations must resist, panelists discussing the “right to be forgotten” told Ryerson journalism students during a recent panel discussion. English, the Toronto Star’s public editor, said that the most common forms of unpublishing requests the newspaper receives are from people who’ve been charged with a criminal offense and have since been acquitted. In some cases, the charges may have even been dropped. The issue of unpublishing made international headlines in May of this year when Mario Costeja González won a legal battle against Google Spain over the deletion of an auction notice that dated back to 1998, when González was forced to sell his property to pay off his debts. The Nov. 27 panel, entitled “The Right to be Forgotten vs. The Public’s Right to Know,” was open to students, faculty and members of the public. In addition to English, the panel included Esther Enkin, the CBC’s ombudsman for English services, and Ryder Gilliland, a media lawyer and adjunct professor at the Ryerson School of Journalism. The discussion was one of a series of presentations on freedom of expression and the public’s right to know organized by Turk, who is a Ryerson Journalism Research Centre associate. English and Enkin said their news organizations rarely remove articles unless information revealed in stories put a subject’s safety in jeopardy. In the Toronto Star’s case, if someone requests the removal of an article on the grounds that it did not report the updates to a case or story, English said the newspaper will either publish a prominent “note” on top of the article informing readers that changes have been made to the story, or update the article’s headline. English pointed to a Toronto Star article that detailed a Canadian citizen who was on trial for fraud. The judge dismissed the charges and the man later requested that the article be removed from the newspaper’s archive, alleging that it revealed a significant amount of personal information and made it difficult for him to continue with his business interests. Since the González decision, there have been more than 170,000 requests to Google for the removal of personal information. The court decision has come under fire, however, for asserting the notion that individuals should be able to control their presence on the Internet. For instance, on Oct. 30, the Washington Post reported that Croatian pianist Dejan Lazic had asked the publication to remove a bad review of one of his concerts under the European Union’s “right to be forgotten” ruling. The 2010 review, Lazic claimed, had damaged his “personal image” because for several years it was available on the first page of Google search results for his name. Lazic’s request was turned down and the Washington Post subsequently ran an article that highlighted the issue of unpublishing with excerpts from Lazic’s emails. Enkin said that like the Toronto Star, the CBC has a policy that does not permit unpublishing articles, especially if the corporation is not the sole source of information regarding a story. In addition to making an exception if serious personal safety issues are involved, she said the public broadcaster will only remove an article if there are legal reasons to do so. She said one way to avoid requests for unpublishing is to grant anonymity to a source right from the beginning when a story is being written. This would not apply to “deep investigative pieces,” Enkin noted, but could be used for stories that deal with a variety of social issues, such as drug addiction. Gilliland, meanwhile, downplayed fears that the González case paves the way for similar decisions in this country. He said the court decision could only happen in Europe, because it was based on a post-war European philosophy that gave more importance to protecting personal information than freedom of expression.